N.B. : this website presents only the visual support used for the lecture given at the International Symposium on Early Globes held at the Musée Stewart au Fort de l'île Sainte-Hélène October 19-22, 2000, at the occasion of the exhitibiton Yes! The World is Round: Three Centuries of Globes, Maps and Early Scientific Instruments. The full text to accompany these images can be found in this publication: Derome, Robert, "An Art Historian's Approach to Globes", in Edward H. Dahl and Jean-François Gauvin, with the collaboration of Eileen Meillon, Robert Derome and Peter van der Krogt, Sphæræ Mundi, Early Globes at the Stewart Museum, Montréal, Septentrion and McGill-Queen's University Press, 2000, p. 25-65. Nevertheless this website contains several images not included in the book: comparative Reinhold Globes; cartouches; stands for the armillary spheres from old books and from the web; the portraits of Ptolemy. There is also some new informations about the Blois celestial globe, the French and the Italian armillary spheres. Some pages contain several images and might be long to get if you have a slow connection. This website is best viewed with a resolution of 1024 x 768 for your webbrowser page. Until otherwise noticed, all globes are from the collections of the Stewart Museum. 2. Mass-produced or individually made? 7. 1577-1580 "ELABORABAT IOANNES REINHOLD A. LOES NIZA"
Les petits navires sur un globe ci-dessous vous serviront pour voyager vers les pages précédentes ou suivantes de ce site web. 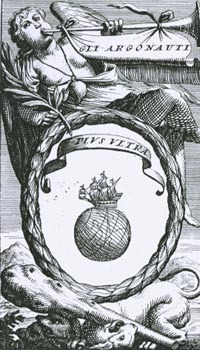 Ils illustrent le frontispice de Coronelli 1697 et constituent le symbole central, sous la devise « PLVS VLTRA », de la gravure utilisée pour identifier la première société géographique au monde appelée « Gli Argonauti », abréviation de l'Accademia Cosmografica degli Argonauti. Le grand globe de Coronelli du Musée Stewart vous servira à revenir à cette table des matières.